Danes will now be starting to watch the festive television series Julekalender (Advent Calendar), with one episode shown on DR and TV2 each week of December until Christmas Day. Different versions of the show are shown by each company, though the storylines are similar. Typically, one character tries to ruin Christmas until the others step in last minute to save the day. DR and TV2 also produce Advent calendars to accompany the programme, corresponding with the events of each episode. As in most of Europe, Danes have their main celebration on Christmas Eve. At 4pm on Christmas Eve church services are held so neighbours can come together, listen to the Christmas sermon and give their pets a chance to chat at home. Families unite at 6pm for the Christmas feast, usually roast duck, goose or pork, served with boiled or sweet potatoes, beetroot and cranberry sauce. For pudding, in a tradition repeated on New Year’s Eve, Danes eat risalamande (rice pudding with almonds). All but one of the almonds have been ground, so the lucky finder of a whole almond is awarded a marzipan pig and will be blessed with good luck for the next year. After the feast, the candles on the Christmas tree (normally decorated with Danish flags) are lit, and the family dance round it singing. Perhaps the most recognised Scandinavian Christmas tradition abroad is the Saint Lucia festival, held on the 13th December. Saint Lucia was a young girl martyred in 304 AD. The most common story told about her is that she would bring food to persecuted Christians living in Rome’s city catacombs, attaching candles to her head so she could have both hands free to carry things. 13th December was chosen as her saint day in Sweden as it coincided with the Winter Solstace, a pagan festival of lights. 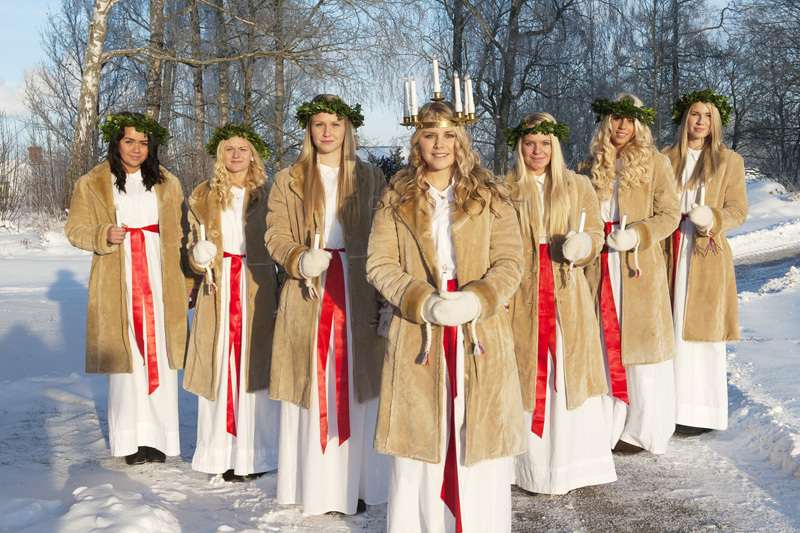 Schools across Sweden select a ‘Lucia’ to process through the local church wearing a crown of candles attached to lingonberry branches. A national ‘Lucia’ is also chosen, whose job it is to visit hospitals and old people’s homes handing out pepparkakor (ginger biscuits). Lucia buns (made with saffron and dotted with raisins) are also popular. Christmas Eve is when Swedes have their main Christmas feast. Unlike most other countries, however, Swedes eat their Julbord buffet at lunchtime. Herring, cold meats (including turkey and julskinka (Christmas ham), meatballs, jellied pigs’ feet and drop i grytan (bread dipped in the juices of the roast turkey) are eaten, then washed down with glögg (mulled wine). 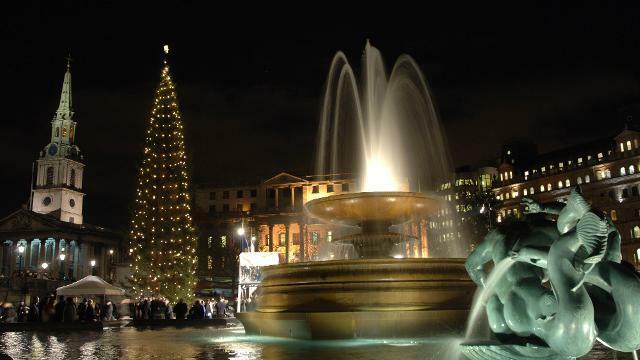 Christmas Eve is also when presents are exchanged, with Christmas Day reserved for church services and the King’s address to the nation. Over 50 per cent of the population tune in to a special episode of Donald Duck: Kalle Anka och hans vänner önskar god jul (Donald Duck and His Friends Wish You a Happy Christmas). Many families make straw goats to guard their Christmas trees, and in the city of Gävle a thirteen metre goat is erected to guard the municipal tree, though it’s a target for vandals and since 1966 has only made it to Christmas Day twelve times. But surely the best thing about Christmas in Sweden is that the festive period doesn’t end officially until 13th January, a month after Saint Lucia’s Day and twenty days after Christmas Day. Jealous? Christmas wasn’t celebrated in Norway until as late as 1100, when the country was Christianised. Nowadays, Norwegian Christmas closely resembles Christmas in the other Scandinavian countries, but some traditions remain unique. These include leaving a sheaf of wheat out for the birds during Advent, and a bowl of porridge for Nisse on Christmas Eve (to guard the farm animals). Carol singing is popular and children often dress up as characters from the Nativity to travel from house to house. An array of cakes and biscuits are made during Advent, one of Norway’s most popular being the Julekake (Hole Cake), combining raisins, candied peel and cardamom. Porridge is eaten at lunchtime on Christmas Eve, served with butter, sugar and cinnamon. Dinner that evening consists usually of pork or mutton ribs served with surkal (finely chopped white or red cabbage cooked with caraway seeds and vinegar) and potatoes. After dinner, presents from friends and family are exchanged, and the next morning more presents are found under the tree, given by Father Christmas (Julenissen) or small gnomes (nissen). If you’ve been very good, you find some from both!